Accurate and reproducible quantification of left ventricular (LV) function is a crucial component of clinical cardiology. LV function should be assessed in each cardiac patient. Earlier, research and development of diagnostic measures concentrated on systolic LV function, because diastole was thought to be a passive process, which is now known not to be the case. However, it is still easier to evaluate systolic than diastolic function. In the physiology lab, LV function is assessed using calculations derived from pressure and volume recordings; in clinical cardiology measurement of LIV wall motion has become the usual method for routine invasive and non-invasive diagnostics (1). We distinguish between global and regional systolic function; in order to assess global systolic LV function, quantification of end-diastolic and end-systolic volumes (LVED, LVES) and ejection fraction (EF) is essential. 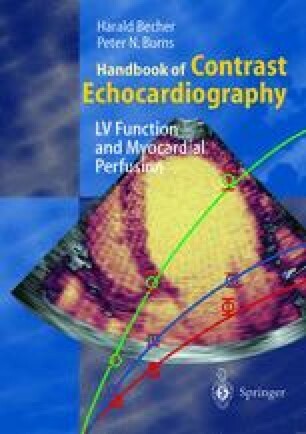 LV volume and ejection fraction are powerful prognostic measures in patients with coronary and valvular heart disease (2).